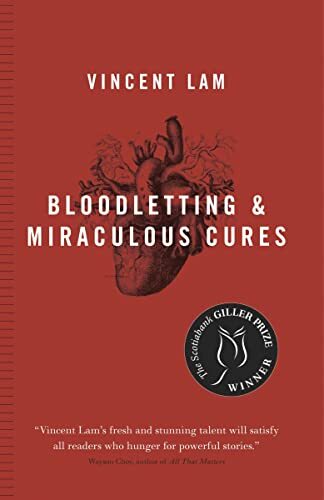 "Bloodletting and Miraculous Cures is an astonishing literary debut, a collection of mature and intricate stories connected through the relationships that develop among a group of young doctors as they move from the challenges of med school to the intense world of emergency rooms, evac missions, and terrifying new viruses. Vincent Lam holds in delicate and skilful tension, black humour, investigations of both common and extraordinary moral dilemmas, and a sometimes shockingly realistic and matter-of-fact portrait of today's medical profession." I liked this book and read it in a single day, but I was quite surprised that he won the Giller for it--of the Giller shortlisted books I've read, I preferred The Immaculate Conception, a much better book in my opinion. Still, it was a promising first book and I will give him another go when book number 2 comes out. I liked the format--short stories told from different points of view and even in different narrative voices but with recurring characters. I've often thought that would probably be similar to the approach I would take were I ever to get around to writing something myself. I was sad to find out what happened to Sri--he seemed to me to be the most interesting of Lam's characters. 1. When you receive the book, make a journal entry to let me know it got to you ok.
2. When you're done, make a journal entry and let us know what you thought. 3. PM the person next in order (please check here for the current order) for a current mailing address (please confirm that they're ready to receive the book). 4. Mail the book, make a journal entry and mark the book as travelling. *keep the book for a maximum of 4 weeks. If you feel you can't read it in this amount of time, or you wish to be skipped for any reason, let me know & I'll rearrange the mailing order. *feel free to include a postcard, bookmark or other trinket with the book. Thanks & have fun reading! Thanks for the swift turnaround, Ibis -- this is only the second book I've had a chance to read in 2006 before the headlines about it had withered away! My best bedside book in years -- each of the tenuously connected stories turned out to be just right for one session of horizontal reading. Thanks for launching it on its rounds, Ibis. I enjoyed the variety of themes and moods, and the unfamiliar professional viewpoints that were brought to bear on painfully familiar situations. (The tellings were usually a bit clinical, but that seemed quite appropriate.) Sadness and joy were craftily mixed. Dr. Lam is not, or not yet, a master of Big Yuks, nor does he try to be. Still, now and again I felt as though I'd stumbled into an urban update of M*A*S*H -- and once or twice I laughed so hard that I almost fell out of bed. Passed along to the next bookringer. Thanks dunzy, for dropping this book off for me. It looks like a good read. I really did not like this book very much. I found it very unsettling, but then that is probably what the author wanted me to feel. The entire atmosphere was one of illness, both physical and mental, and I don't just mean the patients. Thank you Ibis3 for sharing it. This book is now on its way to Pooker3 in Winnipeg. Thanks Ibis3 for sharing it. Book arrived in today's post! I'm looking forward to reading this, but I must say The Globe and Mail's cover blurb gives me pause for thought: "This is a first collection that will find itself shoulder to shoulder with the best first collections published this year." Sounds a bit iffy to me. I suppose it all depends on how many first collections are published and how many of those qualify into the class of the best. I recall that there were always some dumb bunnies in my class pictures! Will let you know. I am about two thirds of the way through this book and hope to get it done by Tuesday so that, assuming I can get to our BC meetup on Tuesday, I can pass it on to gypsysmom. So, I'll jot my thoughts down now. This was definitely not my most "comfy" read. In fact I found it quite unsettling. But thought-provoking. There are a couple of bits that will likely stay with me for ever. The "barbecue" comment for one. Early in my life I developed a list of professions that I knew I could not be when I grew up. Among them, police officer, firefighter and anything in the medical profession. The latter made the list when I unknowingly cut myself and spied my own red blood on the white bread I had been slicing and almost fainted. However, I do have within my extended family both a firefighter and a police officer. As people they are both kind and funny, but I find them both emotionally or intimately distant. I know that they both have a circle of friends quite apart from "the rest of us" with whom they choose to socialize, people from their own profession. I have always surmised that within this circle, they are likely more intimate and personal because of the shared experience, experience that anyone outside their occupation would not, or even want to, understand. Lam very successfully puts my blood stained bread in my face and reminds me that I could not possibly be, would not want to be, a doctor. Well I didn't make it to our BC meeting Tuesday, so gypsysmom and I will meet at lunch in the next few days to make the exchange. That gives me a chance to prattle on a bit more. Having finished the book now, I am struck by how Lam has managed to both dehumanize and humanize (if those are the right words) his doctors as the book progresses. I found myself more intimately connected with them in the earlier stories than the latter. It's as if (much in the same way as I've described my family members in my previous post) they've become more distant emotionally as they've gained experience as doctors. At the same time though they have become more human and fallible. I've always thought that people tended to deify doctors. But doctors are human beings just like the rest of us. That is, people tend to think if they are sick or broken, they just have to do to the doctor and s/he'll fix them. Of course, as in any profession, there are good and not so good practitioners. Some just barely squeaked through med-school. Some have not kept up with the newest thing. Even the best and brightest sometimes just do not know and all of them must make mistakes from time to time. Yes, I definitely would not make a good doctor. I think the pressure to be all-knowing, all-capable would be too much to bear. Passed on by hand to gypsysmom who braved the snow and downtown traffic to pick it up from me. Thanks gypsysmom. Hope you enjoy the book! Sorry to take so long to journal that I've picked this up from Pooker3. My husband was hogging the computer! (This is quite a new thing for him. He bought me (supposedly) a new computer at Christmas and it has all the bells and whistles so he has discovered downloading music (from a pay site) and now he spends even more time at the computer than I do!) Anyway, I am glad to have this Giller prize winner to read although I have another bookring book to read before it. I'll journal again when I finish it. I'm not usually a fan of compilations of short stories. I believe people who write short stories have to be even better writers than novelists because of the limited space, time and words to convey an idea, story or emotion. When I first started reading this book I thought it would also be one of those good attempts but ultimate failures. However, by the time I got to The Long Migration (story #5) I was hooked. The fact that the stories all involve one or more of the characters introduced in the first stories helped I think. Above all, Dr. Lam is a master at choosing the right words and phrases. His pacing fits the milieu of the story so that stories set in the emergency room fit the frantic pace there while the story about his grandfather was slow and reflective I thought. I think Dr. Lam has done a great job of personalizing medical practitioners and I will be keeping that in mind on my next doctor's visit. I'll pm geishabird so I can send this book on its way to the next participant. Thanks Ibis for starting the ring and great job on picking an appropriate picture for the label. I just dropped this book off at the post office so it's on its way to geishabird. I decided to send it by Express Post because the difference between that method and regular post was so little and it includes insurance. Why does it cost so much to send books within Canada? Has anyone ever tried lobbying for a media rate like they have in the United States? Sorry to put this into my journal entry as I suppose it's not appropriate content but every time I mail in Canada I get upset. Received today; thanks very much. Funnily enough, I was sitting next to someone at the bus stop today who was reading this very book; then I come home to find it in my mailbox. It's everywhere! Well, I enjoyed this very much. I'm always fascinated by medical & scientific subjects and found this a terrific read. Lam portrays the frailties and weaknesses of medical professionals with great poignancy and insight. I found this book read much more like a novel than a collection of short fiction, obviously because of the linking stories and characters. (I recently read David Bezmozgis' Natasha and Other Stories and found it very much along the same lines.) And as a result of this, I felt that I could make more of an emotional commitment to the characters, which always makes a book resonate more strongly with me. I particularly enjoyed (if that's the right word!) "Contract Tracing"; living in Toronto as I do, it was interesting to see the SARS outbreak described from this perspective. I really wonder if we're to assume that Fitzgerald didn't survive the SARS outbreak. It wouldn't really surprise me, considering how Lam seems to have chronicled his gradual decline and fall throughout the course of his medical career. It's a sad journey we follow him on. Perhaps it's Lam's way of reminding us that "many are called, but few are chosen"? Again, I thoroughly enjoyed this book. A fascinating and uneasy look into the "magical" world that we all rely on to keep us alive. Perhaps it's time we all gave it a good look, with open eyes. I've PMed CdnLibrarian and will send the book on its way as soon as possible. Thanks for sharing! April 2: CdnLibrarian would like to be removed from the ring, so I've PMed the next person on the list. Also, I found Vincent Lam's website here. Take a look; it's pretty interesting. Book was mailed to deereads today...enjoy! Arrived in yesterday's mail. Thanks for sharing - will be getting into it over weekend!! Very enjoyable reading for me. I agree with some of the other comments made about showing the detachment that can happen throughout a medical career - and I have witnessed this (had it pointed out) in myself!! I work in a busy walk-in clinic and what I consider an emergency is totally different from a patient's point of view. I really enjoyed the story with the elderly lady and her hiccoughs - and then wanting a referral for her rash!! I witness this daily - - "oh, while I am here anyway.....". The story surrounding the SARS outbreak was quite interesting for me to read as I was working through this as well and wore the dreaded masks/gowns/gloves and had the same worries about going home to my family after work. I often feel like people are expecting the medical profession to turn into the same quick-any-time service that we are getting from the "big box stores". Overall - very enjoyable and entertaining for me. Will be looking forward to reading Dr. Lam's next work. Thank you for sharing Ibis. I have sent a PM to the next in line and am waiting for an address. Will post when sent on. April 19/07 - next in line has asked to be skipped. Will contact next in line. glade1 asked to be skipped. Have mailed out today to elizardbreath. Enjoy!! This is not at all what I was expecting! :) PMing Rrrcaron to send it forward! Still not heard from rrrcaron. PM'd cross-patch. Sent to Rrrcaron several days ago. Arrived today. Thank you Rrrcaron and Ibis3. I see this book has been through a lot of hands - and looks very good for all that travelling. I shall try to get it on its way speedily. This wasn't quite what I expected, but what that was I'm not sure. I didn't find it gory at all. I thought the night in ER with Chan was particularly interesting; the relentless grind of case after case leaving its mark on the doctors' sensibilities. There was a sort of short story style in the abrupt change of chapters, but the relationship between the cast was well presented and worked for me. I'll be looking out for more from this author, now that I've had a chance to sample his work - thank you Ibis3 for that. I've just contacted Nell-Lu for an address and shall post on as soon as I have it....ready to go! Bloodletting and Miraculous Cures arrived this morning - thanks Ibis3 for starting the ring and Cross-patch for the book and postcard. I've been looking forward to this one! I'll get on to it when I finish my current book and will send it on its way next week. I found this really interesting. It is well written - the language is both spare and beautiful. The characters come to life and, for all their flaws, I found I cared about them. I liked it that no character was perfect. Even Chen, who seemed close, struggled with night shifts and got road rage. Yet, their imperfections often helped - could Ming have carried out *that* procedure if she didn't have an emotional distance from others? Thanks for sharing, Ibis3. This will be posted to Annodyne this afternoon. Curses! I have just realised that the latest postal strike in the UK starts today and goes on until next Wednesday. So, this book won't be able to travel until late next week, and then will probably go very slowly as there will be quite a backlog. Sorry for the delay. I was finally able to get this in the post yesterday. I'll be keeping my fingers crossed that the ongoing disruption doesn't slow down its journey too much. Excellent timing Nell-Lu! I was finishing the last few pages of my last read when I came home last night to find that this book had arrived. I'm already into Chapter 1, and will journal again in the next few days. Bloodletting and Miraculous Cures confirms what I've always suspected as an outsider looking on: that the world of medicine is a mixture of the bizarre, macabre, chaotic, bone-aching weariness, and downright miraculous. This is reflected in the stories that Vincent Lam has put together in this book, with the common link of a small group of people for whom this has become normality. I have had a break from routine for the last few days with a severe cut in my usual reading time, so I sat up late into the night to finsh "Bloodletting..." I found all the characters and situations engrossing, well written, and believable. The suddenly shocking - and heroic - conclusion to the "Contract Tracing" chapter brought tears to my eyes. Brilliant book! One of the best things about Bookcrossing is that it has given me the chance to read and enjoy books that I wouldn't otherwise have come across. Thanks to Ibis3 for making this Canadian gem available as a bookring. I have sudokugirl's adddress and hopefully it will be on its way to her either today or tomorrow. Edited 24/10/07 to add that it has been posted today by air-mail. Arrived safe and sound today. Looking forward to reading it. Not bad at all, but not exactly a gripping read. Thank you for sharing, Ibis3. The book will be sent to menalima tomorrow. Reveiced book yesterday, going to start reading. Thanks for sharing!! Have finally finished the book, so sorry for the long time I took have had some family issues...have asked marko167 for address. Posted to marko167 on the 1st Oct. I do apologise for the very long delay!! Ooops! Thought I'd registered receiving this book but it appears not, apologies. Anyway, I was looking forward to this collection but sad to say for me it didn't reach my expectations. Whilst one or two of the stories were good the majority just left me flat and feeling short changed. I forced myself to finish it although on more than one occasion it got relegated to back up book as it didn't grip me. Oh well thanks any way. Have PMed amberC for address. AmberC asked to be skipped, DrCris PMed. DrCris has already read the book so have PMed Ibis3 so I can send the book home. Off it flies home to the land of beaver tails and chips with gravy. This book made it back home. Thanks everyone for participating!